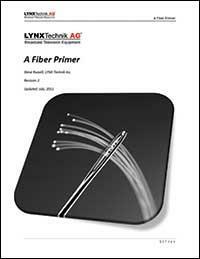 Most of us in the Broadcast industry are familiar with fiber optic transmission systems and the solutions widely used for broadcast applications. These are typically external applications for moving video signals between distant locations, or hauling distant camera feeds into outside broadcast units. Signal distribution within a facility is typically copper coaxial cable, which has been used in one form or another since the inception of television. However, with the transition to HDTV, video bandwidth increased nearly seven fold from 270Mbit to 1.5Gbit. With the further migration to 1080P, video bandwidth has increased even further to 3Gbit. As bandwidth increases, the reach of copper cable reduces and our copper connected world is shrinking rapidly. Cable lengths have been reduced from 350m (1149 feet) at 270Mbit to 140m (460 feet) at 1.5Gbit, and now it’s down to approximately 70m (230 feet) at 3Gbit. If you allow some overhead for cable routing and emergency patch panels etc. then 70m (230 feet) maximum cable lengths imposes serious issues for facility design and expansion…. 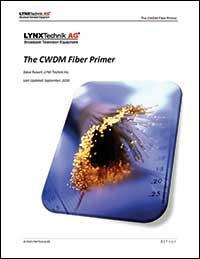 Typically, CWDM is a technology used to transport multiple signals between distant locations over single fiber connections. This leverages the utilization and therefore the relative cost of the long distance fiber cable links. However, with HDTV and the increasing bandwidths required for video production (3Gbit) and new 3D markets rapidly evolving (which makes extensive use of 3Gbit SDI in the production environment) we see fiber connectivity increasingly taking the place of traditional copper (electrical) connections within facilities. As this evolution continues and more and more dedicated unidirectional “point to point” fiber connections are consumed, then an “in house” CWDM solution is the logical next step to better utilize the facilities existing fiber cable assets. Today’s modern digital multi-format installations have resulted in the development of an array of new terminal equipment products designed to address the many needs and demands of such systems. Many devices are complex multi-faceted and multi-functional modules with an array of options and configuration possibilities. A comprehensive control system has become an essential component of any modern terminal equipment installation. LYNX Technik has addressed this with a modular and expandable control system. The two primary building blocks of the control system are hardware components in the form of modular rack controllers, and a software application. 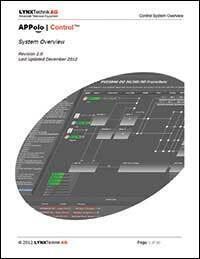 This paper explains the concepts behind the LYNX Technik control susyem and shows how to configure and expand the system from a single rack to multiple larger systems located in different physical locations all under central control. The demand for freely definable Control Panels (i.e. which are not pre-defined by LYNX) is satisfied by LYNX APPolo CustomControl. 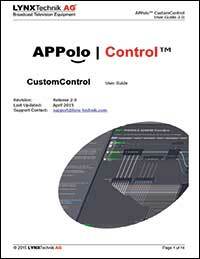 CustomControl provides a powerful, interactive and intuitive way for setup and deployment of one or more Custom Control Designs. Any number of custom-made designs (dedicated GUI pages) can be prepared for all those different applications and operating situations in a system where only a subset of the full power of the LYNX APPolo GUI shall be exposed. Individual Designs can then be loaded and displayed from various workstations and mobile tablet computers. processing. This opens up an entirely new layer of power and flexibility to automated facility control. 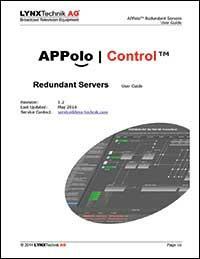 Since the APPolo SERVER is a fundamental part of the system, a backup and failover solution may be required for system servicing and functionality. Users may add a second APPolo SERVER to a system, which serves as a backup or secondary server. 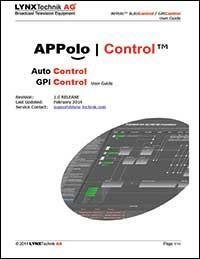 In the case that the Primary APPolo SERVER is not available on the network, the Secondary APPolo SERVER takes over the active role, with all functionality. Therefore, even in the unlikely event of a failure of the Primary APPolo SERVER, the system’s functions are always available. The relationship between analog and digital audio levels. With the widespread adoption of digital infrastructures within Broadcast video and audio standards were implemented to ensure seamless equipment interoperability. For the video portion of the signal the transition was fairly straightforward. Strict standards exist for analog video therefore a predictable transition of the video signal into a digital world was possible. The audio transition has been far more complicated. While published standards exist for digital audio, no standards are in pace for analog audio in terms of nominal audio level, full scale digital audio level and audio headroom. What is used changes by market, geographic location and even application. Audio is still implicitly an analog I/O format. We cannot speak in (or listen to) digital bits, most audio originates in the analog domain and all audio has to be converted back to analog to hear it. With all the variables and no real standardization for analog audio there is an added layer of complexity which needs to be considered. Managing the A/D and D/A conversion of audio signals is critical to assure optimum audio quality within digital broadcast and Post Production infrastructures. 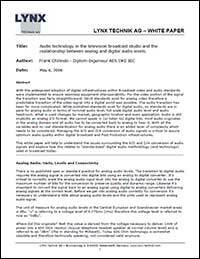 This white paper will help to understand the issues surrounding the A/D and D/A conversion of audio signals and explore how this relates to “standardized” digital audio methodology (and technology) used in broadcast today. The EBU A/V sync pattern is unique to the Testor and the new Testlor Lite 3G. This is an adaptation of an existing 525 / 625 patterns proposed by the EBU in technical document EBU tech 3305. 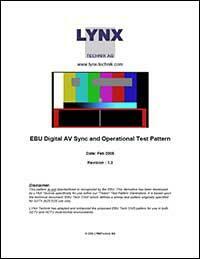 LYNX Technik has adapted and enhanced this pattern for use in modern multi-format (SDTV and HDTV) environments. The pattern has been designed to address a number of requirements in a modern multi-format digital broadcast facility.